Last year in the Designer Magazine "Best Of 2002" Issue our resident movie buff Nick Godkin placed Donnie Darko as 3rd best film of the year behind "Spiderman" and "The Lawless Heart". It wasn't an unusual occurrence as virtually every other publication seemed to rave about this film with the scary rabbit called Frank and yet until this month I still hadn't experienced the Cult of Darko. Does it live up to the hype? Does it work better on DVD and Video? The answer to the questions above are no and yes respectively. Despite the hype Donnie Darko in my eyes does not even come close to cult classic such as "Withnail & I" in the 80s or more recently a film such as "Ghost World". Masquerading itself as an arthouse film it tries to cover too many bases (dark comedy, the complex aspects of space and time and a coming of age story of on Donnie combined) and in the end it fails down to a simple lack of any discernible plot (Ed: The basic plot being that . At the end of the film you are left questioning exactly what was the point of the past couple of hours, where exactly was the story and was this really what people called as the Best Film Of 2003. Admittedly the story involving Patrick Swayze's character Jim Cunningham is a revelation and the addition of Drew Barrymore in a film is always welcome. Jake Gyllenhaal fits the lead role of the mixed up teenage kid, but there is little to suggest that he could develop into a great talent and avoid being typecast as he undoubtedly will be in forthcoming roles. Donnie Darko is a film which leaves you little to cling onto and that perhaps is why people are so intrigued by the cult of Donnie Darko. It certainly questions your preconceptions on life, but whether this is it's intentions or a lack of plot development really can't be ascertained. If you buy the DVD version however it does go someway to explaining the "Philosophy Of Time Travel" and has audio commentary by producer Richard Kelly. 1. 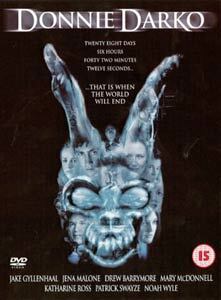 Which actor plays the character Donnie Darko in the film? 2. The film features a scary rabbit - what's it called? Email answers, name and email address to: alexmccann@ntlworld.com placing "Donnie Darko Comp" in the subject title. All correct entries will be placed in a hat and the first name pulled out of a hat will be contacted by email. NB: By entering the above competition you agree to subscribe to the Designer Magazine Email List. Email Addresses will not be passed onto any Third Parties.